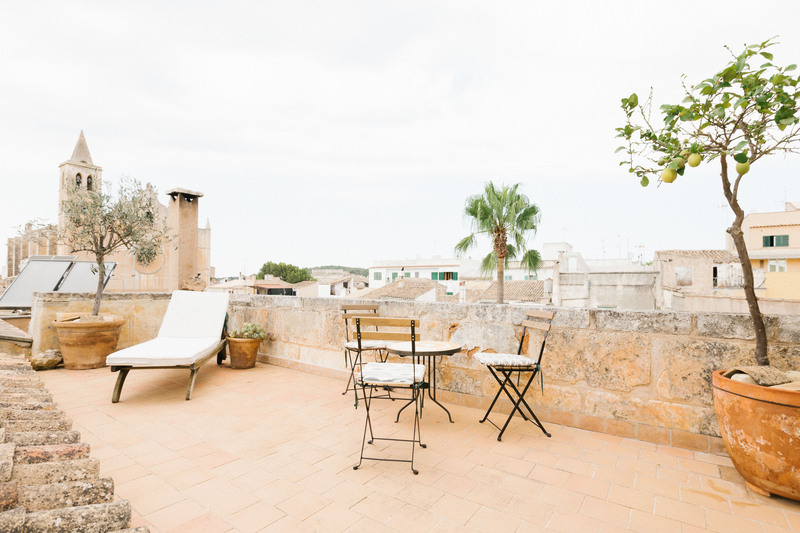 The architecture impresses with ceiling heights of up to 10 meters, elaborated frescoes, exposed beams, sandstone walls and floors, as well as many other structural details of a typical Mallorcan palazzo. The entire domicile houses contemporary art in the form of sculptures and paintings by the well-known artist Ralf Klose, which also represents Klose's largest private collection. The twist between modern and antique and new and old can also be found in the selected furniture. Design classics by Mies van der Rohe meet the Bauhaus and fine baroque antiques. A brilliant firework of the senses and the style elements. In addition to 8 rooms and 3 bathrooms the house offers a developed bodega, various fireplaces, a gas central heating, a high-quality fitted Mallorcan style kitchen with Gaggenau appliances including a self-cleaning stove and a commercial kitchen salamander, various ancillary rooms / storage rooms, a Bang & Olufsen sound system in the whole house, an enchanted patio with pool including a counter-swimming pool and sauna, 3 fireplaces, various terraces and a rooftop with a view over Felanitx all the way to the church and the beautiful surroundings. The imposing entrance with a ceiling height of about 10 meters and a fireplace corner lead to the open, gallery-like dining room and the atrium, the bodega in the lower area of the house and various lounges to relax. The special architecture of modern and old impresses with multi-faceted heights, angles and elaborated restoration work. Exposed dry stone walls, old beams, large wood-paneled doors, terracotta, sandstone and plank floors, as well as antique tiles in the bathroom and in the kitchen underline the charm of the house. The of the enchanted patio with a 15-meter-high palm, which was flown in by a helicopter. The pool and sauna provide the necessary SPA experience. Regular maintenance means that the entire property is in a top condition. The water boiler was renewed last year (2017). In front of the house are various parking facilities, in addition, a garage with service can be rented, which is located in the immediate vicinity. Before the renovation of the present estate in 1998, the approximately 300-year-old palazzo originally served as a classic bodega (wine bar). After an extensive refurbishment, it was and faithfully converted into a dreamlike, extraordinary palazzo in the middle of Felanitx, the market hall. This extravagant palazzo is located in Felanitx, the artist's capital of Majorca. The town in the of the island is very en vogue thanks to its art scene and annual "Nitx " and an authentic piece of Majorca. The restaurant and wine scene is more than ambitious. Wineries such as the "Anima Negra" or the restaurant "Cas Solleric" underline this unique place. The associated coastal town of Portocolom is just a 10-minute drive away and boasts one of the most beautiful beaches in the area. Selected restaurants and bars are known far beyond the borders of the southeastern part of Majorca. The weekly market in Santanyí, the powder white beaches of Es Trenc and the nature reserve Mondragó are also only a few minutes away by car. The entire art collection and the furniture / inventory can be purchased together or separately. Partial art objects and pieces of furniture can also be purchased in addition to the purchase price on a negotiated basis. If necessary, the property, as offered, can also be handed over completely without inventory and art. In total, a purchase price of 400,000 € has been set for the entire inventory.